Below is a 10-inch (254mm) Watervliet M1888MI rifle on an M1896 disappearing carriage at Battery Jasper on Fort Moultrie Sullivan’s Island during World War II, as manned by the U.S. Army’s Coastal Artillery. The battery was named after SGT. William Jasper, 2nd South Carolina Regiment, who, during the attack of the British fleet on Fort Sullivan in 1776, heroically restored to the fort the flag which had been shot away by a ball from a RN ship. Battery Jasper on Sullivan’s Island was completed in 1898 and boasted four 10-inch guns mounted on “disappearing” carriages. A 55-ton counterweight moved the gun to its firing position en barbette. The recoil from firing the 571-pound shell lowered the gun behind the protective, 80-foot thick embankment where it could safely be serviced and reloaded. Though it took 43 men to load and fire a gun, a skilled crew could aim and fire it every 30 seconds. The 10-inch disappearing could fire an armor-piercing shot 8.5 miles. Today, there are no 10-inch guns at Battery Jasper. They were taken out of service and scrapped for the war effort in 1943. However, visitors can tour one of the gun positions and follow the steps the crew would have taken to fire one of these impressive guns. 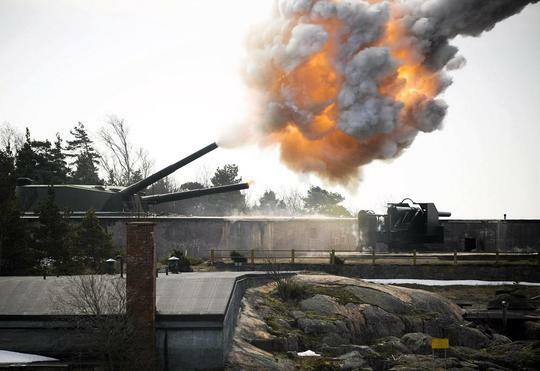 Shots were fired with last week with 305mm Obuhov cannon (305/52 O) to honor Helsinki being capital of Finland for 200 years. 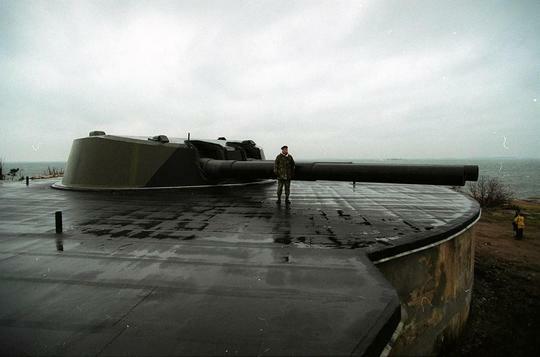 The guns were retired from use in 1982, but one has been kept in shape for these special occasions. The gun was loaded with 80kg of gunpowder and 500l of seawater, leaving some 400m long trail of steam. These guns, almost 100-years old could fire an amazing 50,285 yards with small diameter 692-pound coastal defense rounds. Thats 45kms or about 23-nautical miles. Now thats impressive.